Whenever 2K’s rubberband AI is giving you fits, be thankful you’re not wasting your time on one of these 10 bricks. And no, Shaq-Fu is not a basketball game. 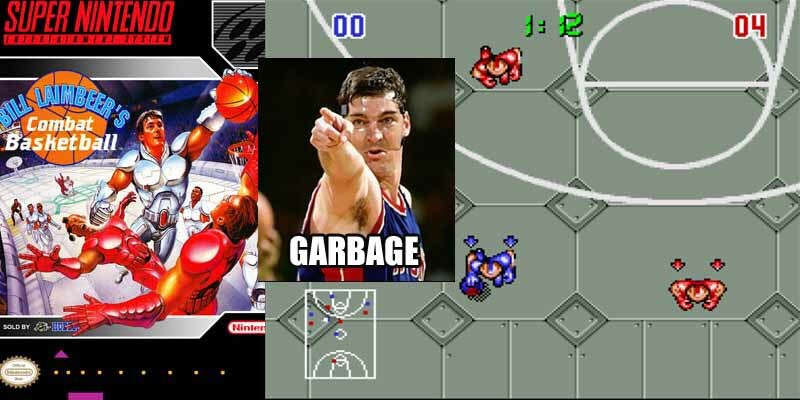 Newer fans may not know about Bill Laimbeer. He was an extremely physical center and all-around badass who won two championships with the the Pistons in 1989 and 1990, delaying Micheal Jordan’s first NBA title. A perfect guy to endorse Bill Laimbeer’s Combat Basketball (SNES, 1991), a game that took all the fouls out of basketball, put players into suits of futuristic armor and allowed them to punch, tackle and even use weapons on each other. The idea could’ve resulted in some good campy fun, but was ultimately ruined by execution. The graphics looked like they were drawn with chalk by a toddler and the top-down view made it very hard to keep track of teammates outside of the barely visible minimap. Still, this is a game that should probably get a remake and get done right, even as a low budget mobile title.